To suggest that Johann David Heinichen's music and theoretical writings have been under-explored would be an understatement. Heinichen and his music has surely suffered the same fate as many of his contemporaries in being overshadowed by the 19th century preoccupation with Johann Sebastian Bach!, yet his works are masterpieces according to the rules of composition still recognised today. Evidence that Heinichen was regarded as a distinguished composer and theorist in his day is found in the quotations of the writers Charles Burney, Johann Scheibe and Johann Mattheson, "The Rameau of Germany," "Nature guides his every note" and "does not just compose, he contemplates and thinks….and shows the world what knowledge is." In Walther's Musicalisches Lexicon (1732) Heinichen's entry occupies two columns while J.S. Bach's only receives two-thirds of a column. It was Mattheson in 1739 who coined the phrase "three important H's of German music" to describe Handel, Heinichen and Hasse. It is only recently that the performance of his work has been championed principally by Reinhard Goebel and Musica Antiqua Köln. Their performances of his work are marked by an imagination and virtuosic gusto that belies the large amount of research and deep insight needed to bring these works to our attention. With respect to modern printed editions of Heinichen's music Max Sobel of Concerto Editions and Michael Walter in particular are continuing this work. Michael Walter's prefaces to his forthcoming editions of La Gara degli Dei and Diana su l'Elba clearly demonstrate the immense research and time spent in their preparation. Heinichen's music can rightly claim to epitomise the Augustan Age, a period when the Saxon Kurhut and Polish Crown were united in the form of Augustus the Strong and his son and successor. The Electors of Saxony, who were descended from the champions of the German Reformation resided in Dresden and it was here that Augustus the Strong was responsible for the creation of one of the most brilliant and extravagant periods in cultural history. Heinichen, uniquely among his contemporaries, Mattheson the 'musicus theoreticus' and J.S. Bach the 'musicus practicus' combined both these functions as the ideal 'musicus doctus'. Heinichen's compositions for the Dresden court capture the spirit of their time and place, they mirror the legendary vitality, superabundance and self-confidence of his patron Augustus the Strong and never lose sight of their duty to represent the King-Elector to the world. Music with an individuality and elan that is irresistible, court music par excellence et par élégance that was performed by the unrivalled Dresden Hofkapelle. Additionally, Heinichen's second treatise on thorough-bass technique Der General-Bass in der Composition has only recently been appreciated as the key source for performance practise and the aesthetic principles applicable to the music of the first half of the 18th century. What is certain is that Heinichen's music that survives today despite the Prussian bombardment and Allied bombing of Dresden would have remained hidden and unheard in the Sächsische Landesbibliothek, (Saxon Court Library) a vast treasure trove of music if it were not for the work of the many musicologists and Dr. Ortrun Landmann in particular. Heinichen's life while centering on three of the great cities of the baroque - Leipzig, Venice and Dresden began on the 17th April 1683 in the small village of Crössuln, near Weissenfels. The Heinichen family line originated in Anhalt-Sächsen about 50 miles from Leipzig. They were middle class workers, tanners, needle-makers and soap makers except for Johann David's father Michael Heinichen who studied at the Thomasschule in Leipzig and was cantor at Pegau. Michael Heinichen attended the Thomasschule and the university at Leipzig and settled in Crössuln in 1674 where he remained as pastor of the village church. By the age of thirteen, Heinichen had in his own words "composed and personally conducted numerous church compositions in small villages." Following in his fathers footsteps Heinichen enrolled in the Leipzig Thomasschule on the 30th March 1696 and according to the enrollment book he was thirteen years old. The Thomasschule connected with the Thomaskirche was already well known for its emphasis on musical training at this time. Schering said that "thought and action, one certainly can say, were arranged by the hour to music" The students were expected to perform choral music at weddings, burials and Sunday services. The four upper classes received seven hours musical instruction each week from the cantor, who in addition to these duties was responsible for musical performance at St. Thomas and St. Nicholas churches. The cantor when Heinichen commenced his studies was Johann Schelle (1648-1701) however Heinichen received private organ and harpsichord lessons with Johann Kuhnau (1660-1722). After Schelle's death Kuhnau, the organist at the Thomaskirche, succeeded him as cantor. In addition to Heinichen, Christoph Graupner (1683-1760) was also a pupil. Mattheson has said that Graupner additionally studied composition with Heinichen during this time. "At that time, namely, I received instruction in composition from the then well known Herr Kuhnau, formerly Director of Choruses in Leipzig, while at the same time I studied the Clavier and sought to imitate my teacher in this endeavour… My teacher had told me something of the previously reported Circle by Kircher, however, this gave me no satisfaction whenever I was determined to go from a major key to a distantly related minor key and vice versa. At that time I still knew nothing of circular modulations in thirds, and neither could I learn more from my teacher…." In 1702 Heinichen entered Leipzig university as a law student and qualified as a lawyer in 1705-1706. While today this may seem a strange course for a musician to take in the early 18th century it was a favoured route. (Kuhnau, Graupner and Telemann were also lawyers) Music was not subject to a separate curriculum but part of the humanistic educational concept of the 'artes liberales'. The two levels of university preparation were the trivium that included grammar, dialectics and rhetoric and the quadrivium that included arithmetic, music, geometry and astronomy. Leipzig, with it's many churches, the new opera house on the Bruhl designed by the Italian architect Giralomo Sartorio and commissioned by Nicolas Adam Strungk (1640-1700), the university and the coffee house performances offered many opportunities for a musician. Strungk, Kapellmeister to the Dresden court had been given permission by the Elector Johann Georg III for his Leipzig opera project in the hope that it would act as a musical training ground for the Dresden court requirements. The success of the fledgling opera was due in no small part to the enthusiasm of the university students were involved in every performance and gave Heinichen his first taste of the 'stylo theatricalis' that he later described in Der General Bass in der Composition. Indeed not only Heinichen but Telemann, Petzold, Graupner, Fasch, Grünewald and Schieferdecker all 'sang' lesser roles! 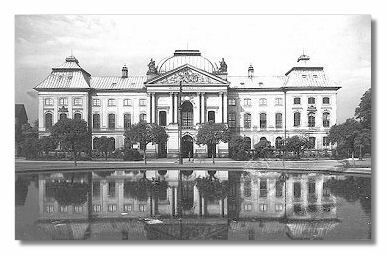 Another important contributor to music making in Leipzig was the universities Collegium musicum that performed instrumental music as well as operatic arias and cantatas in the local coffee houses. Georg Phillip Telemann, (1681-1767) another law student, besides directing the opera after Strungk's death reorganised the Collegium in 1701. Once he had received his qualification as a lawyer Heinichen shrewdly moved to Weissenfels and set up in-practise. Weissenfels while being close to his home village of Crossüln was more significantly residence of the Duke Johann Georg, Elector of Saxe-Weissenfels. The court at Weissenfels was an active musical centre whose Kapellmeister Johann Phillip Kreiger (1649-1725) had studied in Italy and was regarded as one of the great composers of the period, particularly of opera and cantatas. Kreiger undoubtedly influenced the young Heinichen but also found his music interesting enough to direct a performance of a cantata by Heinichen in Weissenfels on St. Michael's day 1711. Another important composer whom Heinichen met at this time was Reinhard Keiser (1674-1739) who was Hamburg's most brilliant musical director. After his return to Hamburg Keiser is supposed to have performed Heinichen's opera Der Carneval von Venedig. "Newly formulated and thoroughly grounded method. How a music lover may, in a very profitable manner, attain a complete understanding of the figured bass, either through his own industry or by being led to it quickly and successfully by others, so that he will certainly comprehend and be able skillfully to perform both sacred and secular music, in particular the accompaniment of recitatives. Further good and profitable instruction is provided, together with many illustrative examples and specially selected useful rules of composition. Also a detailed foreword…"
"Johann David Heinichen previously composed several operas for us of a kind with which one can be satisfied. Now he desires to visit some of the important German courts and their orchestras for the greater perfecting of himself in music. Since he hopes particularly to profit at your court and, better achieve this, has discreetly sought a petition of recommendation, we have not, therefore, refused him. Rather we commend him to your favour with the assurance that he is prepared to carry out all the agreeable duties of my friend and cousin." This decision to travel to Italy was to change Heinichen's life forever and enabled him eventually to enter the service of Augustus the Strong at Dresden. The information concerning the seven years he spent in Italy are incomplete or confused however we do know that soon after his arrival in Venice he was commissioned to write two operas by the Sant' Angelo opera house. Unfortunately upon their completion the director refused to stage the works and Heinichen was forced to sue for the money owed to him. A German cooper called Kühnlein staying at the same hotel as Heinichen not only offered to represent him but also to advance the necessary court costs. Heinichen then travelled to Rome where he was sought out and discovered by Prince Leopold of Anhalt-Cothen. The young prince studied with Heinichen who accompanied him on trips in Italy. Before the end of 1712 he returned to Venice with the good news that he had not only won his lawsuit but had been awarded 1, 600 Venetian ducats in damages. Finally during the carnival season of 1713 two of his operas Mario and Le passioni per troppo amore were staged at the Sant' Angelo opera house with enormous success! Gerber compared Heinichen's success with that of Handel in that the public demanded more repetitions of his operas than for almost any other composer. The operatic success that Heinichen enjoyed was surely because of his assimilation of the Italian theatrical style into his own style and in this his contacts with the Italian composers Gasparini (1668-1727), Pollaroli (1653-1722), Antonio Lotti (c.1669-1741) and probably Antonio Vivaldi (1669-1741) were fundamentally important. Whilst in Venice Heinichen composed at least once concerto, several cantatas, a serenade and the oratorio La Pace di Kamberga (Seibel 19) which was dedicated to the Prince-Elector of Saxony and presumably in support of an application for employment in Dresden. It was his frequent visits to the home of Angioletta Bianchi, the wife of a wealthy Venetian merchant, patroness of the arts, singer and harpsichordist that was to bring him to the attention of the young Crown Prince of Saxony who in 1716 came to Venice on the Grand Tour. Angioletta arranged for Heinichen to compose a special birthday cantata to be performed in front of the Prince's apartment on 17th October 1716. This event is marked by a picturesque description by Hiller. "[Heinichen's music] was performed from the water before the home (of the merchant), which stood ….on the Grand Canal. Crowds of people gathered on the bridge and along the canal. As the first aria was sung, however, the clocks of the city began to strike, preventing the people from hearing. They commenced to indicate their vexation over this by stirring up such a loud noise that one no longer could hear the music. Madame Angioletta immediately asked them politely to be quiet to permit the music to continue. All became quiet again, though a repetition of the first aria was asked for, after which a tremendous cry of approval arose from the crowd; and the remainder of the serenade was received with no less approval." The Crown Prince was undoubtedly impressed by Heinichen's music for he had already engaged him as Kapellmeister to the Dresden Court on the 28th August 1716. Heinichen remained in Venice with the Prince-Elector until end of that year and left for Dresden early in 1717. Heinichen's music The Crown Prince while in Venice also secured the services of Francesco Maria Veracini and an entire opera company under the direction of the Italian composer Antonio Lotti. These appointments must be seen as not only strengthening the Italian musical influence that the Crown Prince favoured but more importantly as preparations for the extravagant celebrations that were to mark the wedding of the Crown Prince to Maria Josepha, daughter of Joseph I of Austria which was to take place in 1719. "The reason why the Dresden court had such strong an interest in Heinichen was his modernity since the fame of any Court chapel depended upon a fashionable repertory (that might be the reason for the lack of interest in Johann Sebastian Bach at the Dresden Court)"
Heinichen's music played an important part in the celebrations in Dresden following the wedding of the Prince Elector and the Hapsburg princess Maria Josepha with performances of his serenata La gara degli dei "The Competition of the Gods" in the gardens of the Dutch, later Japanese Palace on the 10th September. La Gara degli Dei served as an introduction to the festivities of the planets. The participation of the planets, represented by their respective Roman gods in festivities held a long tradition in Europe stretching back to the sixteenth century. Augustus the Strong as an eight year old had participated in the most famous feast of the seventeenth century in Saxony, the 'Most Illustrious Gathering' of 1678 during which the runnings at the head and the ring were presented as allegorical combats between Nimrod and the seven planets. During the 'Ballet of the Gathering and Effects of the Seven Planets', with music by Christoph Bernhard, each of the planets sitting in a festival 'coach' on a cloud had sung an aria about its specific character. The short introductory text to La Gara degli Dei shows that Augustus the Strong deliberately intended to refer to a longstanding Saxon tradition. Among the numerous feasts with which the magnificence of the KING wanted to celebrate the wedding of his serene SON and of the serene ARCHDUCHESS, and after H[is] M[ajesty] had allotted the majors among [the feasts] to different week-days, he decided that these [major feasts] shall be announced by those Seven Planets which gave the respective days their names. For this purpose an appropriate site was chosen in the Royal Garden of the palace which is known as the Chinese one where one sees descending in a magnificent machine: Mercury, The Sun, Diana, Mars, Venus, Jupiter, Saturn. So Augustus the Strong was able to present the house of Saxony as a house of equal rank and standing to the house of Hapsburg. The firework display which followed the performance was clearly conceived as part of Hapsburg tradition and the connection of the serenata and the firework display served to demonstrate the joining of the two houses. When in 1722 the Prince-Elector was awarded the order of the Golden Fleece by Charles VI a Saxon poet wrote that now the meaning of the firework display in 1719 had come to light! Whilst Heinichen's Dresden Concerti and his sacred music have been recently re-discovered and performed, principally by Musica Antiqua Köln, his major secular vocal works have until now been unknown to the broader public. Michael Walter in the preface to his first modern edition (forthcoming) of this work gives several possible reasons for the lack of publications of Heinichen's music. Certainly no editions appeared in Heinichen's lifetime, due to their protected status, however, the fact that the manuscript had been subjected to water damage and is in consequence hard to read in combination with the (mistakenly)long held belief that ceremonial works of this kind lack musical value have conspired to keep this music from our ears! Heinichen simply rose to the occasion of having at his disposal an orchestra and vocalists of the highest quality and amply demonstrates his compositional skills to their full extent in this work. "Saturn's aria I rapidi Vanni (No. 13) with its long concert-like ritornellos is obviously destined to present the skills of the theorbo player Sylvius Leopold Weiss and one of the hornists. In this aria Heinichen combines the theorbo with a solo horn and dispenses with the strings to achieve, in combination with the male voice of a tenor, a sonority presumably unheard before. This aria was not the only piece to show the brillance of Dresden musicians. In the Sonata (No. 1) Heinichen gives the two hornists, a violinist and an oboist the opportunity to demonstrate their skills. These opportunities are not only inspired musically, they also serve the purpose of demonstrating that August the Strong was able to engage (and to pay!) the best instrumentalists available. The solo violinist in the Sonata was presumably Johann Georg Pisendel as it is written in a most modern Italian style and in consequence unlikely to have been played by the concertmaster Volumier who was more inclined to the French style. It can be assumed that the solo oboe part was played by François Le Riche, the then best paid oboist in Dresden. In Mercury's aria Traggan pur da strana riva (No. 11) the famous Pierre Gabriel Buffardin, teacher of Quantz, presumably played the modern flauto traverso. Again, the ritonello is concert-like." 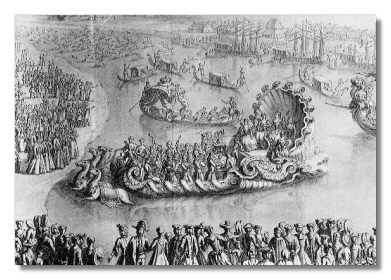 "After the court was seated on the right-bank of the Elbe, there appeared the gilt and silvered ship, constructed like Diana's chariot and drawn by four seahorses down river. There, on board was the goddess herself with her nymphs, such as Climente, Daphne, Niese, Alcippa, next to the royal musical ensemble, who were all clad in green taffeta, and who, as they approached the royal hunting tent sang an Italian cantata with all sorts of instruments, entitled Diana upon the Elbe (Heinichen). When this was over, Diana and her nymphs, as well as the entire musical ensemble, debarked where they watched the hunt." Heinichen's compositions for the wedding celebrations must have pleased his patron Augustus the Strong as he received a salary increase of three hundred thalers in the same month! For a more comprehensive description of the wedding celebrations. As the festivities spilled over to October a performance of Heinichen's new cantata, the Serenata di Moritzburg took place as part of the royal hunt and festival at the Moritzburg Palace. For the carneval season of 1720 Heinichen composed his first and as it turned out only opera for the Dresden opera, Flavio Crispo. This was never performed and remains incomplete. The composition, broken off due to a violent quarrel which took place during rehearsals between Heinichen and the Italian singers Senesino and Berselli. It was because of this that Augustus the Strong immediately issued a royal decree dissolving the opera company. In consequence Heinichen devoted the remainder of his life and service at Dresden mainly to the composition of cantatas and sacred music for the Catholic court church. The creation and establishment of a new tradition of Catholic church music corresponding to the elaborate court music of the day was not easy. In his later years Heinichen's ill health meant that he required assistance from his friend and colleague Jan Dismas Zelenka. After the closure of the opera house Catholic church music, in artistic terms, became a kind of Ersatz opera that found room, alongside more conservative varieties of church music, for brilliant expressions of the concertante spirit and aimed to emulate the most up to date composers such as Caldara and Vivaldi. In 1721 Heinichen married in Weissenfels and the birth of his only child is recorded in January 1723. Little is known of Heinichen's professional life during this period, however we do know that his contemporaries at Dresden Johann Georg Pisendel and Quantz studied composition with him. Also during this period he rewrote his thorough-bass treatise that was published at his own expense in 1728 as Der General Bass in der Composition. In his final years Heinichen's health suffered greatly and on the afternoon of the 16th July 1729 he was buried in the Johannes cemetery after finally succumbing to tuberculosis. Thorough Bass or figured bass technique is the fundamental basis for all Baroque music. By the beginning of the 18th century figured bass practise including its notation and sound structure had penetrated all musical forms. Reimann described the period 1600-1750 the "era of the thorough-bass." In the late Baroque period between 1700-1750 a style rich in ornamentation where the performers own taste was almost as important as the notes written by the composer meant that a code of musical aesthetics was developed in which the figured bass as the basis of music-making formed an essential part. It is due to his theoretical writings that Heinichen has received his best and worst press so to speak. In his day he was obviously regarded as an authority on figured bass technique as the writings of Mattheson and Walther testify. Later historians however painted an entirely different picture criticising Heinichen's music as "lacking an understanding of the practical use of counterpoint" and characterising him as an overly critical theoretician whose music displayed more "the thinking artist than the invention rich mind." Modern thinking has until recently placed reliance on a different source for thorough-bass technique, Carl Phillip Emmanuel Bach's Versuch uber die wahre art das Clavier zu spielen. Whilst Carl Phillip Emmanuel's work relates to the later transitional age in which he lived Heinichen's work is now being recognised following study and use in performance as a source of immense value particularly in its discussion of the stylo theatricalis and the picture it provides of Italian operatic style in the late baroque period. Der General Bass in der Composition is a monumental work which places Heinichen amongst the great writers on musical theory and practices in musical history. "No music connoisseur will deny that the Basso Continuo or so-called thorough-bass is, nest to [the art of] composition, one of the most important and most fundamental of the musical sciences. For from what source other than composition itself does it spring forth? And what actually is the playing of a thorough-bass other than to improvise upon a given bass the remaining parts of a full harmony or to compose to [the bass]?" One major difference between the two versions is that Der General Bass includes footnotes. These contain many of Heinichen's personal observations on musical practice and malpractice, discussions of the first principles of music and the requirements of a good modern composer. Heinichen compares and contrasts German, French and Italian music and suggests the advantages in a new style mixing the best elements of French and Italian music. "Experience teaches that….paper music receives more credit in one nation than in another. On nation (Germany) is industrious in all endeavors; another laughs over useless school work and tends to believe skeptically that the 'Northerners' [Tramontani] (to use their manner of speaking) work like a team of draft horses. One nation [Germany] believes art is only that which is difficult to compose; another nation, however, seeks a lighter style and correctly states that it is difficult to compose light music….One nation [Germany]seeks its greatest art in nothing but intricate musical "tiff-taff" and elaborate artificialities of note writing. The other nation applies itself more to good taste, and in this way it takes away the former's universal applause; the paper artists [Germans], on the contrary, with all their witchcraft remain in obscurity and, in addition, are proclaimed barbarians, even though they could imitate the other nations blindfolded if they applied themselves more to good taste and brilliance of music than to fruitless artificialities. An eminent foreign composer once gave his frank opinion….regarding the differences in music of two nations. "Our nation," he said, …." is more inclined to dolcezza (gracefulness, tendresse) in music, so much so that it must take care not to fall into a kind of indolence. Most "Northeners" [Tramontani], on the other hand, are almost too inclined to liveliness in music, so that they fall too easily into barbarisms. If they would take pains over adapting our tendresse and would mix it together with their usual vivacite, then a third [style] would result that could not fail to please the whole world." I will not repeat the comments I made at that time, but will say only that this discourse first brought to my mind [the thought] that a felicitous melange of Italian and French taste would affect the ear most forcefully and must succeed over all other tastes of the world." As the summary of the contents shows Der General Bass is much more than a figured bass method but also an instructional manual for composition and includes Heinichen's views on the contemporary style and the aesthetics of the age in which he lived, which in performance practise terms are of inestimable value. Der General Bass is more than twice the size of his earlier treatise. Chapter 1 deals with musical intervals and their classification. Chapter 2 with the common chords and how they may profitably be taught to beginners. Chapter 4 with quick notes and various measures. Chapter 5 with the application of the chords, signatures and quick notes in all other keys . Chapter 6 with the embellishment of a figured bass and the further practise of a beginner. Chapter 1 concerned with the resolution of dissonances found in operatic works. Chapter 2 with the figured bass without signatures and how the latter are to be divined in chamber and operatic music. Chapter 3 with the accompaniment of recitative in particular. Chapter 4 with the application of the rule given, which together with sundry practical observations, is illustrated clearly and usefully in an entire Cantata. Chapter 5 with a musical circle, from which the natural order, relationship, and modulations of all the key can be thoroughly learnt, and most profitable use of which can be made, both on the keyboard and in composition. Chapter 6 with a useful practical exercise and certain hints about aiding one's won progress and seeking perfection in figured bass. The following is an extract from the Bach Dokumente which details the representatives responsible for distribution of Der General Bass. "This is to inform all 'music lovers' that Capell-Meister Heinichen's of Dresden latest work, named Der General Bass in der Composition, will be found in commission at the request of good friends at the following German locations: with the Capell-Meister Mattheson in Hamburg, with the Capell-Meister Graupner in Hessen-Darmstadt, with the Concert-Meister Simonetti in Wolffenbuettel, with the Royal Cammer-Musico Mr. Gloesch in Berlin, with the Capell-Meister Bach in Leipzig, with the organist and mathematica Lindner in Freyburg and with the author in Dresden. As the transport to the named locations involves high expenses, the 'music lovers' will be understanding and willing to pay, in addition to the reasonable price of 2 Reichthalers, two, four or six g. for postage according to transport costs. N.B. Walthers Musicalisches Lexicon Litera is available for two g. from Capell-Meister Bach in Leipzig"
Johann Mattheson was a Hamburg composer, theorist, journalist and outspoken and prolific commentator on almost every aspect of 18th century musical practice who is one of the few contemporary musicians referred to in Der General Bass. J. G. Buelow plausibly suggests that whilst no documentation survives to suggest that Heinichen and Mattheson were personal friends, the familiar tone of Heinichen's references to Mattheson suggests more than a professional contact. Indeed Heinichen's choice of the same printer in Hamburg used by Mattheson, Benjamin Schiller rather than a more convenient printer in Leipzig or Dresden may have been influenced by Mattheson? Perhaps the most conclusive 'proof' that a friendship existed is provided by a letter from Heinichen whilst on his deathbed requesting Mattheson collect money owed to Heinichen by a Hamburg merchant, money that would help support his family after his death! Heinichen's compositions that remain despite the ravages of the bombardment by the Prussians and the greater devastation caused by the Allied bombing of Dresden in the Second World War are housed mainly in the Sächsische Landesbibliothek (Saxon Court Library), in short score form. A few however migrated to Darmstadt (16 works survive today) due to Heinichen's continuing friendship with Christoph Graupner, a fellow student of Kuhnau's at the Leipzig Thomasschule. After Fasch's visit to Dresden in 1727 interestingly some are to be found in the inventory of the concert room in the castle at Zerbst, near Magdeburg. Few modern editions of his works appear, in part due to the "protected" status applied to the compositions by the Electors of Saxony who regarded them as their own property, which prevented their widespread dissemination. Musicologists today struggle with the alterations that were made when these works were secretly distributed. Max Sobel of Concerto Editons publishes more of Heinichen's music than any other publisher! Michael Walter has recently completed editions of Diana su l'Elba and La Gara degli Dei and Reinhard Goebel is currently preparing an edition of the Lamentationes. Undoubtedly Heinichen's experiences in Italy had a profound effect on the formation of his compositional style, as Reinhard Goebel points out "if it is compared to that of his years as Kuhnau's pupil, when he produced a good dozen pieces of German church music, and some solo and double concertos, none of which are more superior to the average standard of the time". However it was his contact with the virtuosic Dresden Hofkapelle during his engagement as Kapellmeister to the Dresden court where Heinichen's "Augustan" style developed. The size and virtuosity of the Dresden Hofkapelle was without rival amongst orchestras at this time and clearly Heinichen revelled in composing music for such an ensemble. This is clearly evident in his use of an astonishing range of instrumental textures and sonorities in combination with a mixture of French, Italian and German styles and varying forms. This multiplicity produces a vital energy and individuality in the music we hear which epitomises the Dresden court for which it was written. His compositions are the apotheosis of absolutism in sound! During his twelve years at Dresden he wrote only one opera Flavio Crispo that was never performed, five serenades (homage cantatas), 50 liturgical works for the Catholic court church, 60 Italian cantatas and the festive "concerti per l'orchestra di Dresda." After the dissolution of the opera in 1720 Heinichen, a Protestant was primarily responsible for the development of the repertoire of the Catholic Hofkirche (Catholic Court Church), he even advertised himself as "composer of Catholic church music." His unfulfilled ambitions for sacred music included a complete cycle of psalm settings, masses and mastery of the genres such as sepolcro and the requiem mass. It is in the Festive Concerti per l'orchestra di Dresda or concerti per molti strumenti that Heinichen's imagination runs riot. Duplication in terms of formal layout is rare and each one is individually crafted. They appear as 3, 4 and 5 movement works and the complete orchestra appears in nearly all of them. It was a Dresden practise for orchestral oboes to double the violins - colla parte in the ripieno group, the lute was a permanent member of the ensemble and is a soloist in one of the concerti. In addition transverse flutes, recorders and horns (as soloists) are occasionally used. However what is unique is that not only do soloistic instruments vary from movement to movement but also the accompanying instruments. We have a concerto (Seibel 217), described on the score itself as "concerto grosso" in which up to 8 solo instruments are used - two transverse flutes, two violins, two violoncellos and two bassoons. Unisonic writing, in the Venetian style was held in particular esteem in Dresden, virtuosic bass writing, complex harmonies, purely descriptive writing and the insertion of quotations are all melded to produce an effervescent joie de vivre. Here is music that fully realises the potential of the Dresden Hofkapelle at its zenith! In Heinichen's sacred music written for the Catholic court church his immense skill as an orchestrator is combined with an assurance in the manipulation of form, text and vocal performance to provide the listener with a religious experience which upon comparison to the often austere feeling of much of J.S. Bach's work in this genre is akin to opening all the windows to let in fresh air. Some of the autograph manuscripts of his sacred music remarkably have performance timings added. These when realised in performance produce uncommonly fast tempi on the one hand and astonishingly slow tempi on the other. Heinichen's works were systematically catalogued by Dr. Gustav Seibel in 1913 and Günther Hausswald in 1937 using a different system catalogued only the instrumental music. When one compares his works to that of J.D. Zelenka, Heinichen's music suffers in not having one unified numbering system the benefits of which are obvious. Library references and publishers use either Seibel or Hausswald's numbering system and cd titles often do not use either. In addition a number of Heinichen's works which are included in Seibel's and Hausswald's catalogues were destroyed in the Second World War and it is clear that Heinichen's oeuvre needs reassessing. I am currently reviewing the source references to try to achieve this. Any information regarding library source details would therefore be much appreciated! Copyright © 1996-2000, David Charlton.